Swissvax Detailing Products are part of a world-renowned car care system that is handmade in Switzerland, featuring product contents which are a closely guarded secret dating back to the 1930’s. It is mostly made of Grade One Brazilian Carnauba Wax, often found in cosmetics due to the glow it imparts, mixed in with essential oils. Carnauba Wax is hand scraped from the leaves of the palm plant ‘Copernicia Prunifera’ that is only found in the northeastern states of Brazil. Switzerland’s reputation for quality and precision is reflected in our products. For over three generations we at Swissvax have been committed car lovers and collectors. Our unique products do not have to meet either sales targets or production budget constraints. This has allowed Swissvax to become what it stands for today: high-value care by perfectionists for perfectionists. Over the years Paul has built up a strong working relationship with the people at Swissvax even going as far as to partnership with the Detailing Product manufacturer and produce his own signature blend Detailing Wax, Crystal Rock. 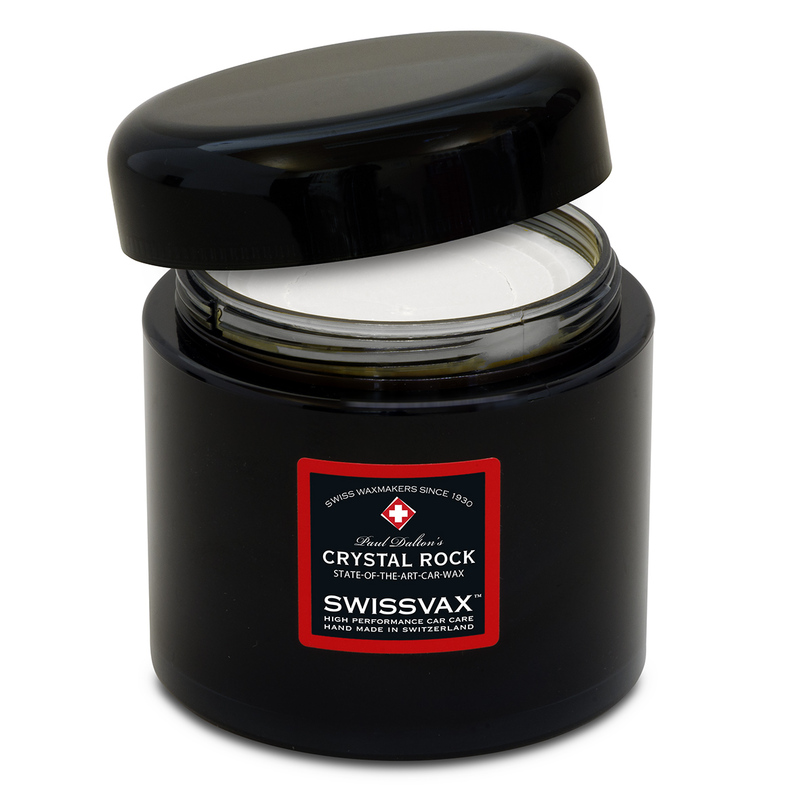 Crystal Rock has been painstakingly developed by Paul and Swissvax to offer the best performance of any wax in the world. Swissvax Crystal Rock is probably the best car wax in the world right now. Interested in Paul’s Swissvax Detailing Experience? Recently, Paul visited the headquarters in Fällanden, Schweiz and worked with Swissvax to put together a series of ‘How-to’ style videos on how to carry out your very own Swissvax Detail. Paul explains the first stage in any Swissvax Detail, the Washing Process. A good wash technique is vital to prevent micro scratches and holograms and keep the shine looking perfect. Paul explains why the two bucket method is more important than people think. Paul shows us the correct method for cleaning and detailing wheels to remove contaminated brake dust and ingrained dirt safely without scratching the surface of the wheel. The Swissvax Wheel Cleaner Forte is an non-acidic wheel cleaner safe for all wheels. It’s great ‘active indicator’ tells you when it’s worked it’s magic by turning purple! Paul shows us how to pretreat the paintwork with Swissvax Cleaner Fluid Regular and apply his signature Crystal Rock wax. Preparation is key for the wax to ‘bed’ properly and last as long as possible. The Cleaner Fluid Regular is a pre-wax oil with no cut enabling you to effortlessly remove contaminants like tree sap, bird lime and tar, to name a few. This episode is all about quick detailing. The well known car detailer and Swissvax ambassador Paul Dalton, seen on “Fifth Gear” and many other TV-shows, visited Swissvax headquarters in Fällanden, Switzerland. We got to shoot a video series starting where Paul shares his thoughts and techniques of car detailing. Quick detailing is a very simple technique made simple by Swissvax’s ingenious Lotos Speed! Paul demonstrates just how simple it is to use. Swissvax Lotos Speed is a quick sealing for all exterior paintwork. The frictional resistance is massively reduced, resulting in excellent water beading properties of the paint surface. Lotos Speed is colorless and easy and quick to use. Simply spray on, then distribute and wipe off. It does not leave white marks on rubber or edges and can be applied across various materials. Its advanced polymer technology seals paint, rims, plastic, chrome and glass. Lotus Speed works on both untreated and (even better) Swissvax treated paintwork and can last for months. PRO TIP: Quick detailing is perfect for that in between wax applications, car shows, concours events or just to keep the vehicle looking on top form. I does not however, replace a full wash technique.